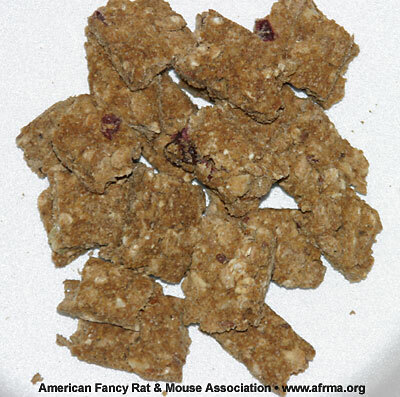 This is a snack for your rats and mice that you can make in your oven or dehydrator. When using a dehydrator, the nutrients aren’t cooked out like baking. The dehydrator is more gentle with air flowing through it, not sitting on anything getting brown. The whole point is to not kill off the vitamins and the dehydrator will do a better job at that than baking. I pulled them out of the dehydrator about 10 minutes ago and passed them out to the rats . . . nobody stopped eating until they were completely gone. The mice liked them. They were not as enthusiastic about them like the rats but did eat them. 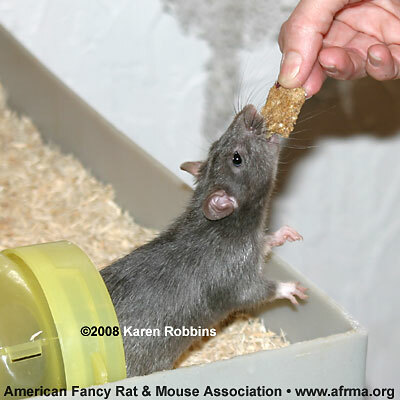 “KKS2020-1 Madeline,” a Russian Blue Irish Satin young rat grabbing a cookie; owned by Carol Lawton.